There’s nothing that puts that spark out between you like discussing the household chores, responsibilities of life and children. Learn to set aside time each day where you both discuss dreams, desires and goals that you have as individuals and a couple. Putting a priority on engaging in a meaningful conversation with your spouse on a regular schedule will help to spark that love interest as you once had during your honeymoon phase. One thing that cures boredom every time is ensuring that you surprise each other every so often. This cannot be something you do on routine or it doesn’t work to make your spouse fall in love all over again. On occasion do something that makes your spouse jaw dropped, smile or even shed a tear of joy because you took time to surprise them by doing something that matters to them. Learning to do random surprises on occasion will help to reconnect your bond as a married couple. There’s nothing that ruins the marriage faster than always hearing someone criticize you or put you down for things you mess up. Remember that you both are imperfect human beings and work hard to ensure you are saying positive things to each other on a regular basis. Perhaps you both work to say three positives to each other for a week? This will surely make you fall in love with your spouse all over again in no time! Think about a place you both travelled or something you both did together in the past that helped you bond as a couple. Try to go back to that place or re-enact this favorite memory as a means to spark that little part of your heart that fell for your spouse back then. 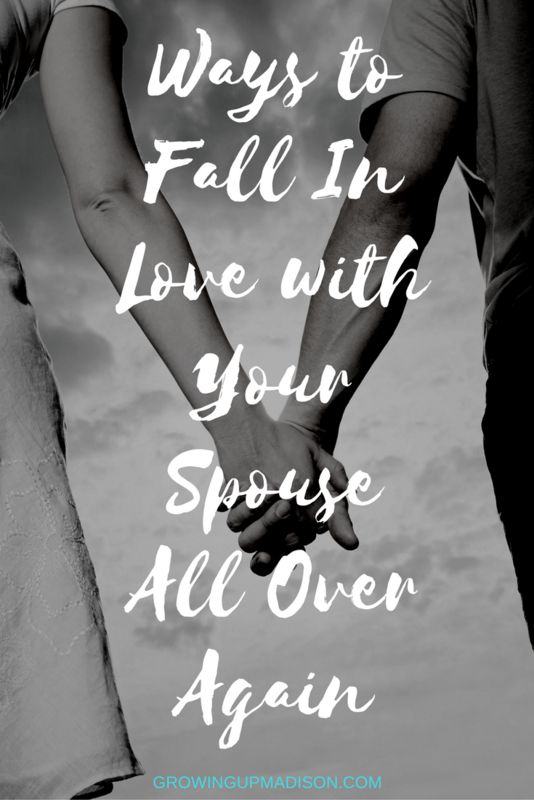 Learning to be aware of what sparked your connection in the first place and making that happen again is a huge part of falling in love with your spouse all over again. Not everyone is into cuddling, but perhaps you are someone who’s love language involves affection, if you and your spouse are those sort of people then you must ensure that cuddling happens more often. Few people enjoy a good night sleep when cuddling up together, but try to ensure that first portion of the evening when you lay down is spent snuggled up for a bit so that you spark that deep connection between the two of you. Cuddling can surge that feeling of love between you two and ensure that you fall in love with your spouse all over again. There are many things you can do to try to fall in love with your spouse all over again, it’s a mere matter of ensuring that you take notice of what allowed you two to bond in the first place. Once you establish what made you two fall in love in the first place, you are quickly able to reconnect by bringing that back into your marriage today! Let's discuss: Are there other ways can you think of to fall in love all over again? I think surprises are awesome. And channeling that spark and effort you first have when dating. Flirty texts. Conversations. Dates. Trips! Surprises are awesome and you're right about doing the things when you first started dating. It's forgetting those things that makes marriages deteriorate. I love this! I've been married to my husband for a long, long... lloonngg time. While we've never had any major explosions in our marriage, I know there are times when we could wring each other's necks. So falling in love all over again is absolutely key. Marriage is work. HARD work. And part of that work is remembering who you fell in love with before you had kids and responsibilities and discovered all of those things about your partner that absolutely drive you nuts. Love this! Marriage is hard work and deciding whether or not you want that marriage to work is something that you have to consider. These are all great ideas. Now that our son is grown we have started having weekly date nights. That is awesome! I can't tell the last time I've been on a date night, whether it's to a movie or just a drive to nowhere. I must admit, after 18 years, it is hard to get the spark sometimes. I do need to reach out and try and cuddle more often. I've been married 11 and I can say that our spark is now gone. I love these! We have been married 25 years so we have a lot of special memories we could recreate. That is awesome! While I have a few that I would have loved to recreate myself, I'm no longer inclined to do so. I really, really, REALLY needed to read this! I am doing the exact opposite of some of these things. I am not trying to be mean to my spouse or sabotage anything - these ruts are easy to fall into without even realizing it! Oh yes they can be, that I do know of. These are all such sweet suggestions! Our anniversary is next month, so it's the perfect time to add a little extra love into our relationship. Congrats on your anniversary and it's always good to show a little extra love. I think sometimes it's being ok with just being goofy. We forget to do that sometimes. Having a sense of humor sure is a good way to bring that spark back. Some great suggestions and I like that they are all things you can just do and not have to spend a lot. It's usually the simple things and that doesn't cost money. I like these ideas and they could work with newer relationships too. I think keeping things fun is important. Oh that is very important and it pays not to be uptight all the time. My husband and I love to look back and re-enact memories. It's fun and it keeps our love alive. These are great tips. Sounds like you two have a really great relationship. That's fantastic! It is good to refresh yourself and love yourself in order to be a good partner. When you take care of you then you have energy to expend on someone else. Oh you should take care of yourself first, if you don't, who's going to take care of you. When you're happy, everyone else is happy. That is a great idea. Getaways can be a lot of fun. I love this post so much! Practical tips and reminders every couple should know and remember! Thank you so much for sharing this! You're very welcome Toni, and thank you for stopping by. These are great ideas. It's so important to connect with your spouse to keep the spark alive. It is very important to connect and without that spark, your relationship is basically doomed. These are really great ideas. Life can definitely get in the way and throw you off track. Life sometimes get in the way but it's up to you to make that difference. These are great ideas. It is so important to maintain your martial relationship, especially once your family grows! Yes it is and a lot of people tend to forget that. Oh that is awesome. Falling love with each other all over again is what it's all about! Good tips. I was just saying to my husband that we need to go on a date night. Maybe we should go recreate our first date....fun! Oh that sounds like a lot of fun. I'm sure you would both love that! Wow, these are really nice tips. I love surprises too! Surprises can be a lot of fun! I am awful at planning surprises. The business of every day gets in the way but I need to take some time to do that like when we were dating. I'm not very good at surprises either but you have to make the time. I think it is important to try to keep your spouse guessing. Surprises are always a fun way to make someones day. These are great tips. Surprises are a lot of fun. I love getting them but it's been a while for me. What about you? Being in the midst of this crazy busy time of our lives, we have trouble finding time. But committing to time alone with just the two of us helps. You've got to find the time. When you start neglecting each other, that's when you have trouble. I second this. Cuddling is my specialty! Kudos to you! Thanks for stopping by! What a sweet post! My husband and I have such a hard time finding one on one time! You've got to make time, it's what caused the breakdown in my own marriage. While I had the time, my husband never could find the time for me. Here's hoping that my next relationship will be different. I wish my husband surprised me more often. He has no idea the impact an unplanned for coffee, gift, or plan would be for me. I used to wish the same thing, now I've just resigned myself to the fact that it will never happen, but you're right, it can make your day when you're surprised with even a drive. Life and kids can definitely get in the way. It's important for couples to reconnect. It's very important to reconnect and you have to remember the kids won't always be around, but your spouse will. These are all such great tips to become close with your spouse again. Surprises are awesome for sure. Oh yes they are and I hope my tips will work for you. Sounds like you really put thought into it before you got married. I wish I could say the same for me. Have regular one on one time sans kids. This is a big one for us. It doesn't have to be a big date night out. It could be a picnic for two in front of the tv after the kids go to bed, just make sure it's something that is yours and for you both. I love this list! It's a list I put together because I know what it's like to be ignored and neglected. I'm hoping it'll help others because it will surely help me in my next relationship. Well if you have a spouse it will help you, if you don't then it'll still help for when you do have one.